THIS SERVICE BULLETIN IS ALSO BEING RELEASED AS RAPID RESPONSE TRANSMITTAL (RRT) 15-014. ALL APPLICABLE SOLD AND UN-SOLD RRT VIN's HAVE BEEN LOADED. TO VERIFY THAT THIS RRT SERVICE ACTION IS APPLICABLE TO THE VEHICLE, USE VIP OR PERFORM A VIN SEARCH IN TECHCONNECT. ALL REPAIRS ARE REIMBURSABLE WITHIN THE PROVISIONS OF WARRANTY. This bulletin involves inspecting for and if necessary installing the Side Steps. 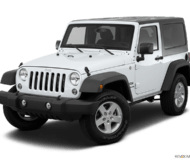 NOTE: This bulletin applies to vehicles built on or before January 9, 2015 (MDH 0109XX) equipped with Wrangler X Package (Sales Code AEB). Side Steps are missing. Inspect for and if necessary install the Side Steps. If a customer’s VIN is listed in VIP or your RRT VIN list, perform the repair. For all other customers that describe the symptom/condition listed above, perform the Repair Procedure. NOTE: Each Kit provides left and right Side Steps. Only one Kit has to be ordered to repair one vehicle. Install the Sides Steps. Refer to the detailed service procedures available in DealerCONNECT> TechCONNECT under: Service Info> 23- Body> Exterior - Step, Side. 23-09-01-91 Side Step - Inspect And Install Left And Right (0- Skilled) 6 - ELECTRICAL AND BODY SYSTEMS 0.3 Hrs. EASY TO INSTALL - Easy bolt-on installation. No drilling or cutting required (Remove the rock guards if your car has them). All mounting hardware and Installation instruction included. 【Corrosion Proof and Resist Scratch】Durable wall over built powder coat painted steel construction reducing the corrosion percentage, heavy texture finish resist scratch. Sealed end caps keep any debris from getting inside the bar, providing longevity and an overall clean look. 【Customer First & Warranty】AUTOSAVER88 running boards provide 5 year warranty ! FREE REPLACEMENT POLICY and MONEY BACK GUARANTEE make no risk for you! With nothing to worry about, try it today! 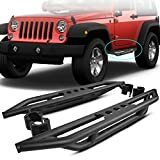 Hooke Road Rock Crawler Side Steps Nerf Bars fit for 2007-2018 Jeep Wrangler Unlimited JK 4-Door,please Note these products won't fit 2018 JL. 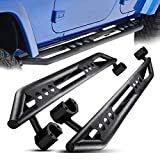 Weight: 72 Pounds;The drop off height of the side steps is 15.5 inches; With logo "since 1941"
Hooke Road Side Steps Nerf Bars fit for 2007-2018 Jeep Wrangler Unlimited JK 4-Door,please Note these products won't fit 2018 JL. NO-HASSLE WARRANTY - OE quality standard. 5-Year warranty against manufacturing defects! Easy to install, with NO DRILLING required for most trucks. 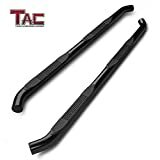 Step bars bolt on to your truck's rocker panel or frame. 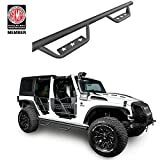 BLACK 4" inch aluminum side steps with full coverage step pad - supports up to 300 LBS on either passenger or driver side. 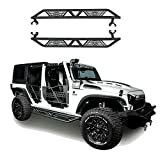 Check fitment notes or click on SEE ALL VEHICLES THIS PRODUCT FITS link. iBoard running boards fit dealer installed mudflaps or splash guards.